In this guide, we will extend on the Redis service we released in earlier guides. If you haven’t created and installed a Redis service via Replicated on Swarm, please start with Creating a Swarm App and Installing. Now that our Redis service is running on a Replicated on Swarm install, it is time to start iterating on and deploying releases for our application. While Software as a Service deployment environments are often static to your environment, enterprise environments are diverse and require the ability to adapt your service to their environments. 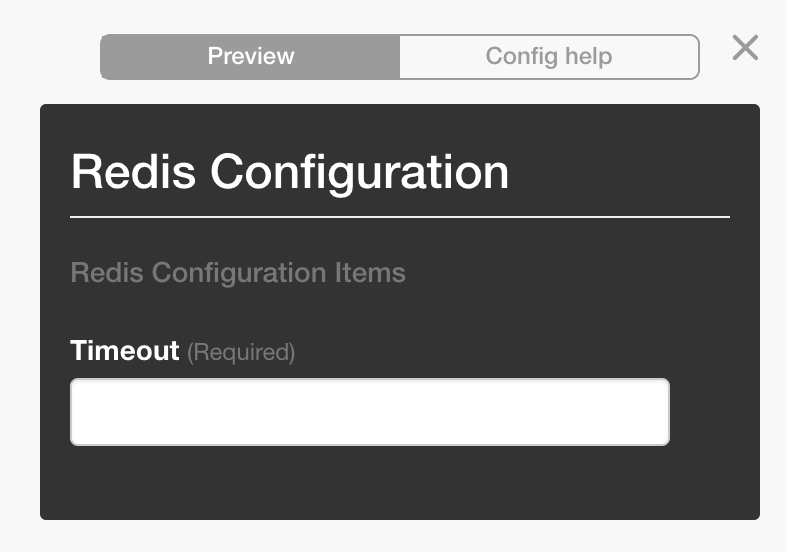 In this guide, we will add a configuration value to set the Redis timeout, create a Redis configuration file, and template this Redis configuration to match this configured timeout. When the configuration is changed, a new configuration value will be written and used by our application. To start iterating on our application, navigate to the Releases dashboard from the Replicated Vendor Portal. On this dashboard, you will see the first release that we created. At the top, click the “Create release” button. Once again, we are on the Create a Release page with the YAML editor that we used in Creating a Swarm App. This time the content reflects the last release we created, and includes our Redis service. This YAML defines a configuration option named redis.timeout that is required. On the right, our preview has updated to match this new config option. Next, we will template this field into a redis configuration file and expose that file to our Redis service. This specifies our redis_config as an external source pre-defined in docker config. When scheduling our application, Replicated will create this Docker config so that it can be used by our application. The configs section takes our external redis_config file as a source, and mounts it to the target location inside of the service container. Because Redis takes a configuration file as it’s first argument, we explicitly supply a command to the service definition to use this file. This release is now ready. Save it and return to the Releases dashboard. We can now promote this release and update the instance we created in the Installing section. The Release Dashboard shows 2 releases now. We can see that release sequence 1 is pinned to Unstable. Before updates are propagated to channels, we must update the channel to the release we want. 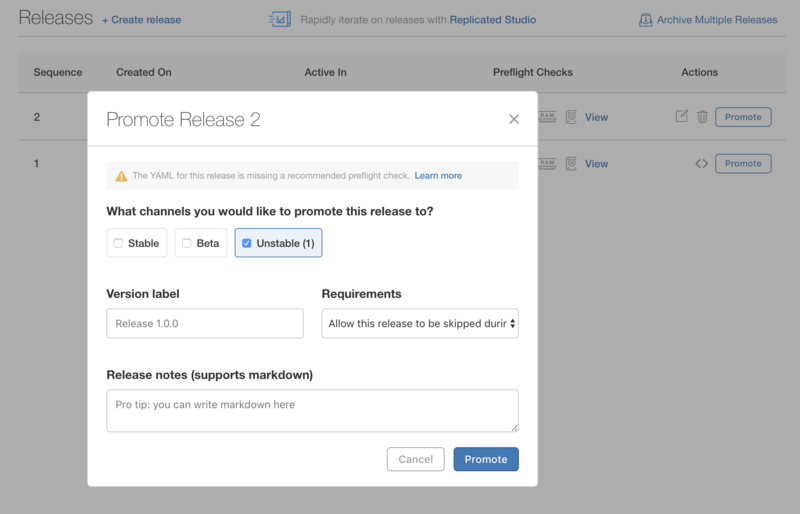 Click “Promote” next to release sequence 2, check the “Unstable” channel, and promote the release. Our release is now the current version for the “Unstable” channel. It’s now time to update our application. The Installing section required us to install Replicated and a license onto a new server. Return to that server’s dashboard with our running application. The base dashboard has a “Check Now” button that we can use to discover and update to our new release. Click it, and we will be prompted to install the new release. Click “View Update” to go to the updates page. This page lists the release history for this application. Install the update by clicking the “Install Update” button. After the release is installed, we need to re-configure our application to start it. Go to the “Settings” page where our new timeout value is available. Enter a number like 0 to disable it and return to the Dashboard to start our application. You have successfully created a Docker Swarm app, converted it into a Replicated on Swarm application, and deployed it to a running server running Swarm. From there, you created a new release to make it configurable for your end users. You’re ready to begin customizing this application to meet your needs, or create a new one from scratch. As always, we are here to help you succeed on building your application in Replicated. For more help, check our community or our Swarm documentation.